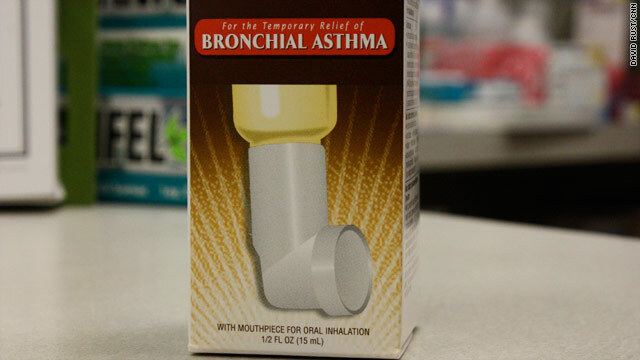 The Food and Drug Administration is reminding doctors and patients that Primatene Mist, the only nonprescription asthma inhaler in the United States, can no longer be sold or prescribed after December 31. Asthma patients are urged to get prescriptions for alternative medications, since this treatment option runs out at the end of the year, the FDA said Thursday. Primatene Mist, an epinephrine inhaler, made by Armstrong Pharmaceutical Inc., contains chlorofluorocarbons, a chemical known to deplete the ozone layer. After the United States signed an international agreement - The Montreal Protocol on Substances that Deplete the Ozone Layer - to phase-out the compounds, the FDA announced in 2008, that these inhalers could not be made or sold in 2012. "If you rely on an over-the-counter inhaler to relieve your asthma symptoms, it is important that you contact a health care professional to talk about switching to a different medicine to treat your asthma," said Dr. Badrul Chowdhury, director of the Division of Pulmonary, Allergy and Rheumatology Products in the FDA's Center for Drug Evaluation and Research. Chlorofluorocarbons are chemicals that contain fluorine, chlorine, and carbon. With inhalers, they are used as a propellant to move the medication, helping the user to breathe it in. According to The National Library of Science at the National Institutes of Health, once released, the odorless, colorless and nontoxic compounds get into the Earth's atmosphere where they break apart and release chemicals that destroy the Earth's ozone layer. CFCs can last more than 100 years in the atmosphere. The FDA says a number of manufacturers have already replaced their CFC inhalers with a propellant called hydrofluoroalkane or HFA, which is more environment-friendly, but there's currently no HFA version of an epinephrine inhaler available. Epinephrine is a hormone that's used to treat life-threatening allergic reactions. It opens up the airways in the lungs and allows patients to breathe more easily. CFCs have been used in products like refrigerators, air conditioners, cleaning products and aerosols since the 1930s. Those products with CFCs were banned in the U.S. in 1995. They've been used in inhalers since the 1980s. Chowdhury says asthma patients can continue using an inhaler that's not empty by the December 31 deadline as long as the expiration date is still good. He says HFA inhalers are safe and effective, but warns they may taste and feel different. "Talk with your health care professional to make sure you are using it correctly and getting the correct dose." According to Chowdhury there are two prescription inhalers that still use CFCs. Those products are also part of the international agreement and they have phase-out dates of December 31, 2013. "During 2001–2009, the proportion of persons of all ages with asthma in the United States increased significantly (12.3%), from 7.3% (20.3 million persons) to 8.2% (24.6 million persons)." "a rising trend in asthma prevalence was observed for non-Hispanic black children (11.4% to 17.0%), non-Hispanic white women (8.9% to 10.1%), and non-Hispanic black men (4.7% to 6.4%)"
"Prevalence among adults was greatest for women (9.7%) and adults who were poor (10.6%)"
"rates disproportionately greater among children, women, blacks, and those reporting income below the federal poverty level"
"More uninsured persons with asthma than insured could not afford to buy prescription medications (40.3% versus 11.5%), and fewer uninsured persons reported seeing or talking with a primary-care physician (58.8% versus 85.6%) or specialist (19.5% versus 36.9%)"
"compared with those who had health insurance in the preceding 12 months, nearly four times the number of the uninsured persons with asthma were unable to buy prescription medication (40.3% versus 11.5%) and fewer reported seeing or talking with a primary care physician (58.8% versus 85.6%) or specialist (19.5% versus 36.9%) "
"26.0% (3.2 million persons) reporting emergency department or urgent care center visits and 7.0% (850,183 persons) reporting having been admitted to a hospital. Thus, 13.6% (or nearly one in seven) of persons with asthma had an asthma attack that required urgent outpatient care." "The estimated total cost of asthma to society, including medical expenses ($50.1 billion per year)"
"Similar to findings in previous studies (3–6), in 2009, asthma was more prevalent among children, women, non-Hispanic blacks, the poor, and in the Northeast and Midwest"
"The prevalence and number of persons with asthma have increased since 2001, and demographic differences among population subgroups persist despite improvements in outdoor air quality and decreases in cigarette smoking and secondhand smoke exposure (11–13). Although probable causes for the increase in asthma are unclear"
"Persons with asthma need to have access to health care and appropriate medications"
"there is no benefit of Primatene Mist over existing options"
"Most people who use Primatene Mist do so out of convenience rather than financial need"
Translation – Anyone saying it has helped them is either dumb or a liar. We know cause we're smarter than any of those lazy tightazz insured fakers. "Many manufacturers have switched the CFC in their inhalers with the environmentally friendly propellant called hydrofluoroalkane"
"Since then, several manufacturers of prescription inhalers have converted their propellants to environmentally friendly hydrofluoroalkane"
Wow, won't be long now and you guys will have this planet back in top shape! Is this HFA some sort of wonder compound? Ummm, looks like you might have left something out – global warming potential gases?? "the global warming potential is 1300 times higher for HFA-134a than for carbon dioxide"
"HFA does not affect the ozone layer, but it exerts a significant effect on global warming, as it is one of the six greenhouse effect gases"
i) Control of the production of HFA for the use of non-essential items. ii) No ban on the use of HFA in essential products such as MDI till an alternative substance is available for use." If I can't breathe do you think I care about global warming! This is a fleecing. It is sickening to think that people would intentinally take this drug off the market. Sick people ingest this in their body, they don't spray it into the ozone. I'm sick of these so said greenies who care more about the jungle and whacko science than about their fellow neighbors who are suffocating! it's not the 'greenies' as you said, nor the 'whacko science'. it is the pharmaceutical companies and our government.... do you think all those 'hair care products' i.e. hairspray will ever be outlawed? even though many come with a warning that they contain a voc and is not allowed in california... ????? no. this is just a ploy to have folks pay $70 and up vs. $17. PLUS the cost of going to the doctor to get that prescription...... i'm no conspiracy mongering person. i don't see ufos. i just call it how i see it. this is in essence utter bulls**t.
and this is exactly why primatine is gone... it's true. $40,000 vs. what a couple of hundred dollars? i'm so sickened. i'm sorry paul hernandez, that our government has f***ed us. It's my opinion that a foreclosures can have a significant effect on the debtor's life. Home foreclosures can have a Six to few years negative effects on a client's credit report. The borrower who may have applied for a mortgage or any kind of loans as an example, knows that the actual worse credit rating is usually, the more challenging it is to have a decent bank loan. In addition, it may possibly affect the borrower's chance to find a good place to lease or hire, if that becomes the alternative property solution. Good blog post. the blue inhaler may be sataulbmol and you may be getting immune to it , also if you have a tired lung if you are over tired and if you have been doing any heavy lifting do you feel as though you have pulled any muscles around the lung area also are you run down or coming down with a cold all these things may be taken into account as to why you are feeling the way you are but if nothing here is correct to you then see your dr as your treatment may need to be changed good luck Was this answer helpful? it is OK for the smokers to kill us with second hand smoke-it is OK to use spray paint in and outdoors-etc. This removal was for the pharmaceutical companies to increase their already huge fortunes-take an $18 asthma reliever off the market and replace it (for now) with a starter kit-$29 and then 30 refills for $45. The govt has its hands into everything-now they are telling us to find a new med for our asthma-go to the hospital-or die in our homes. The govt has taxed us beyond belief-and gives all of our taxes to other countries that hate us-who in turn build nuclear weapons to kill us. This is a sad time for our country. I truly believe this is why there will never be a cancer cure-dr's-nurses-health care workers in total-radiology-high tech machinery-meds-etc will be out of business-or not paid for. There is no shortage of ill people in the US so when a dr. loses a patient it is "next". These machines cost a million each and up-so they will keep that patient on meds and machines as long as the insurance pays. A friend of mine is on dialysis-they were told they could not have a transplant. Now four years later-and 575,000 paid by the ins to dialysis they were informed they could have a transplant when a donor is found. Really-who is fooling who-half the price of the machine has been paid for already. By the time (if one i found) a transplant can happen-either the machine will be paid for or (hopefully not) my friend will be deceased. Regarding the CFC's in the Primatine inhailer, There is no proof that the CFC even enter the atmosphere after inhailing the mist! It would seem to me to have proof before taking a product off the market, not just to a whem of a left org. that wants CFC's off the market! Primatene mist worked much better than any prescription inhaler I have taken. The reason it's off the shelf is that why let people get relief from a product that doesn't require a prescription or a Dr's visit when a little legislation can make it three times as expensive and half as effective. You know it is true. I'll be a witness at their eternal judgment. After reading all these posts, I have to ask why you care what someone else uses for their asthma? I guess you are all for the Nanny State and I'm really happy because now we can all get fast food joints to serve healthy foods, get soda and snack machines out of schools, get school lunches to be healthy, ban soft drinks over 16 ounces, and get all the overweight people into weight control programs, and unfit people into fitness programs. I'm thrilled that now we can clean up our country! Long live the Nanny State and all of you guardians! To any doctors listening: albuterol is NOWHERE near as effective as Primatene Mist was. The fact that the uncaring FDA (made up of doctors?) shot down the FHA version proves that this was not an environmental issue. Also, the price of albuterol shot up. I am now paying twice as much for albuterol , which works about 10% as "well" as Primatene. Hey FDA, WHY AREN'T YOU BANNING CIGARETTES????!!! Talk about pollution and unheathiness! But guess what? Sicker patients = more doctor visits = richer "healthcare" INDUSTRY. It is sad to see the rampant greed that the medical field has become, while many asthmatics, myself included, are suffering daily. In a county like America this is disgusting. Even doctors will admit that asthma is increasing. So FDA & AMA, what are you doing to help us??? What about those poor souls without insurance or who only have mediocre insurance. Albterol cost me $30 w/insurance. How much more is it w/o insurance? Plus the cost of an office visit... Come on FDA. Develop a BACKBONE and CONSCIENCE and help us asthmatics. Thanks for posting this, I appreciate your info!